Suspense stories: which are more about potential victims escaping a looming threat. Thrillers: which are generally about experts who prevent crimes before they happen. Capers: which are about committing crimes, and are usually told from the criminal's point of view. And most important ... why did they do it? Of these, the first is the concern of the external plot and has given these novels the nickname, "Whodunnits." The second is the basis of "locked room" and other "puzzle" mysteries that appeal to a limited readership. The third question is most important for the majority of readers: "Why was this person killed?" Answering that question prompts an investigation and analysis of the web of dysfunctional relationships surrounding the victim and a probing of human psychology that readers find infinitely fascinating. 1. A crime is committed. Traditionally, the first thing you learn about how to write a mystery novel is to begin with a murder. The discovery of the body does not have to happen in the first chapter, but the murder should occur by the end of the first act. Note that it should be a real murder. A bait-and-switch, such as having the murder turn out to be a suicide or a faked death, can disappoint or annoy readers. If you are a plotter by nature, you may want to begin by deciding who commits the murder, how, and why before you start writing your first draft. Other writers (pantsers) may not answer these questions until they have almost finished a first draft (an approach which may require more revision later on). a) Amateur: An unpaid detective who likely stumbles onto the case by accident and investigates without invitation or pay. Amateurs often rely on their understanding of people or unusual areas of expertise to solve crimes. Often these stories have less "on-page" violence. b) Consultant: Not a professional investigator, but someone with special relevant skills or expertise who works with the police. Many television crime shows today use this type of detective. c) Private Investigators: Often these are ex-cops who have become jaded by their past experience. These tend to be darker, grittier stories with more violence and lower class characters than are encountered by amateur detectives. d) Police Detectives. Police often have more resources than other detectives, such as forensics teams. They also have the power to make arrests, get search warrants etc. Generally, detectives in mystery novels are gifted with better than averages instincts or reasoning abilities, with the exception of police detectives, who may rely as much on their training and resources. While there are cases in which the main character of a mystery novel is the detective's sidekick (e.g. Dr. Watson), the detective will usually be the main character. With that in mind, choose your detective carefully. If you are lucky enough to write a series, you will have to live with your detective for a long time. So make him or her someone you and the reader will like and care about. 3. The crime presents a challenging puzzle for both the detective and the reader. Easily solved crimes don't make for novel-length works. Also, readers usually like seeing a clever detective in action. They may lose respect for a one who is slow to spot an obvious solution. Bear in mind that, while readers also like to solve the puzzles themselves, they have more respect and get more enjoyment from puzzles they fail to solve. Especially, they like solutions that only appear obvious in hindsight and they admire authors who create them. 4. The detective solves the crime by collecting evidence and testimony and analyzing it through logic. A basic rule in all fiction is that the outcome of the story should result from the main character's actions and choices. If you apply this rule to the task of how to write a mystery, it's obvious that the detective must be the person who solves the crime. It can't be solved by someone else. Nor can the murderer just turn himself in. Moreover, the detective must use logic and evidence to find the right solution. He can't solve it with a lucky guess, serendipity, ESP, or by torturing all the witness until one confesses. Mystery novels affirm the scientific method. Even if the detective is not a trained scientist, she must use reason and evidence to deduce the murderer's identity. 5. Readers must have all the evidence the detective does. Since readers enjoy trying to solve the mystery themselves before the detective, you must give them a fair chance at guessing correctly. So the Golden Rule of how to write a mystery is that you must give the reader all the information the detective has. It is considered unfair if the detective solves the crime because of some fact that was withheld from the reader. 6. The writer tries to throw the reader and detective off the scent. 7. The detective succeeds in solving the crime by the end. Your detective should figure out by the end who did the murder, why, and how. And the solution must be shared with the readers, otherwise they will be very disappointed. Of course, there are exceptions, but they are rare. 8. The solution makes sense. If you try to pass off a solution based on fuzzy logic or one that is contradicted by the evidence, readers will be very annoyed. 9. Traditional mysteries satisfy the reader's sense of justice. Some modern, more literary mysteries may question the meaning of justice or have a more ambiguous ending. However, most mysteries satisfy the reader's sense of justice with an ending that punishes the wicked and makes the community safe again. In fact, many readers will be disappointed if that doesn't happen. You'll notice it is a four-act model, with each act beginning and ending with a driver. The drivers are the major turning points in your plot. The acts are series of events in which people react to the previous driver and tension builds to the next driver. 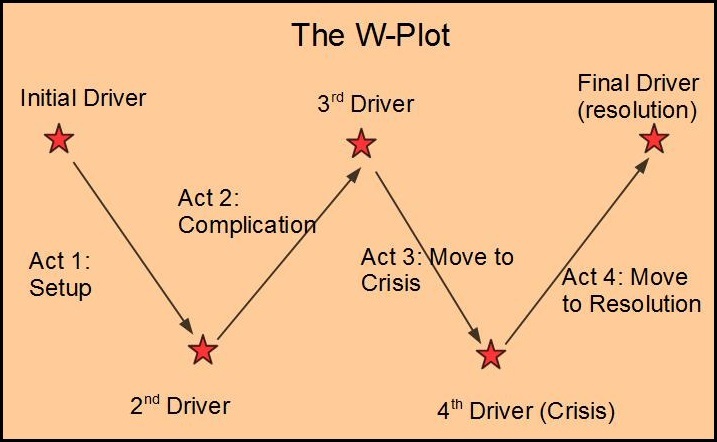 There are two main ways this model can be applied to the task of how to write a mystery novel. I'll start with the traditional one. Initial Driver: Someone is murdered. You can decide to show the murder or simply have the body discovered. The initial investigation of the crime scene occurs. The detective is called to investigate. The immediate facts and circumstances are established. An initial list of potential witnesses or suspects may be drawn. There may be an obvious but false solution presented, such as "accidental death." 2nd Driver: A discovery is made that makes the crime problematic. Whatever this event is, it shows the murder is not a simple "open and shut" case. There is a deeper mystery that must be solved. The detective expands the investigation, gathering clues. chasing down leads, and interviewing witnesses. All the sordid details of the dysfunctional relationships between the victim and the people around him are revealed. The investigation broadens to include multiple suspects. It often seems as though everyone had a motive for wanting the victim dead. Here something happens that makes the stakes higher or the solution more difficult. The detective may discover that he has been on the wrong track or that some larger plot is unfolding. Evidence may show the prime suspect couldn't have committed the crime. Sometimes a second murder or other crime takes place when the prime suspect has an alibi -- a choice that not only signals a dead end to the current line of investigation but also creates a bigger threat (what if the murderer keeps on killing?). In this act, the number of suspects narrows as various possible solutions are proven to be impossible. Contradictions in the evidence or testimony show that some witnesses may be lying or some evidence may be false. The tension builds as the case seems increasingly difficult to solve. Something happens at this point that makes the case appear impossible to solve. The detective has run out of options and seems to have hit a dead end. Here, a new option or possibility (the real solution) is hit upon. The detective may have a flash of insight or experience a sudden breakthrough. Of course, the actual solution is not immediately revealed, even though all the evidence has been. You can tease the reader a little. But the action is now moving towards the revelation of the solution. Finally, the correct solution is revealed. In classic mysteries, this often involves gathering all the suspects together and having the detective give a speech in which he explains why most of the suspects couldn't be guilty, and then finally reveals the real murderer, who is immediately captured and brought to justice. That seems a little hokey now, as does having the murderer recite a monologue explaining why he did the crime. Nonetheless, you must reveal the solution in some manner. Traditional mystery novels tend to be more plot-driven, but today's readers often prefer more character-driven mysteries. They like to spend more time exploring the web of dysfunctional relationships surrounding the victim and the murderer. a) They don't yet know the backstory, so they don't realize the event is a trigger. b) The trigger event seems insignificant at the time. c) The trigger event is hidden within a collage of other events. d) The murder doesn't happen right away. The web of dysfunctional relationships is presented and the characters in the web are introduced in this act. There may be a lot of subtext or obvious tension between various characters, with no explanation as to why. The initial driver may be hidden within this act rather than appearing at the start. The detective's personal life may be introduced. The murder may happen in this act, but is not discovered right away and is often not shown to the reader. The body is found, triggering the investigation. This is still the investigation, but now, in addition to gathering evidence, emphasis is on the detective discovering why all those relationships are dysfunctional. After this, the structure is pretty much the same as in a traditional mystery. It used to be acceptable for detectives to be somewhat aloof. That is, the drama in a mystery occurred among the other characters surrounding the victim. The detective was an objective outsider. Today, readers are just as interested in the personal life of the detective as the victim. They want detectives who are riddled with inner conflict and wrestle with moral dilemmas. In fact, mystery readers often enjoy following the personal life of the detective throughout his or her career. Act 1: Show who the main character is at the start of the story, how he or she approaches situations or handles problems. Act 2: Show how the detective is pressured to change -- to shift to a new approach. Act 4: Show whether the detective made a good choice (on a personal level). Have they resolved their conflict in a way that brings them peace, contentment, happiness, etc. Are they in a better place or not? Sometimes a detective can catch the murderer and still feel empty inside afterward. The best way to create inner conflict is to give your main character an impact character. This is someone who represents a different approach and causes the main character to doubt himself. The impact character may get the detective to question his values, his understanding of right and wrong, whether in regards to the case or his personal life. The murderer, who attempts to lead the detective in the wrong direction. A false suspect who distracts the detective, possibly by creating moral uncertainty. A contagonist, who delays or hinders the detective or possibly tempts him away from the case. This could be a femme fatale (or perhaps an homme fatale). A mentor, boss, partner, witness, etc. 1. Look for an interesting milieu to set the story in. When drawing room murders became humdrum, mystery writers started looking for other environments or social milieux to set their murders in. So we have mysteries set in such diverse worlds as horse racing, antiques, gardening, beach resorts, film studios, military bases, high fashion, etc. where the solution to the mystery depends on knowledge particular to the chosen milieu. If there's a particular hobby or community that interests you, consider using it as a setting for your mystery. 2. The end should be in the beginning. The reader should have all the information needed to solve the crime before the detective solves it. However, the most crucial piece of information should be given in act one or two (giving readers plenty of time to forget about it). Also, if you are a pantser and you don't decide on a solution to the mystery until you get to the end, remember that you can go back and revise the first half of the book to make sure all the necessary clues are in place, albeit hidden among false clues. 3. Tie up all loose ends. Chances are you have created some secondary plot lines or mysteries along the way that need to be cleared up at the end so readers are not disappointed. 4. Unless you are determined to write a standalone work, your detective should stay steadfast. Assuming you give your detective an inner conflict, it is handy to have him resolve his personal crisis by renewing or doubling down on his initial approach rather than changing. The reason is that you may want to write a sequel, so you want the detective to be the same character in the next book. So, by all means, pressure your detective to change, tempt her all you like to change. Create an impact character who can argue for why she should abandon her principles, give up the chip on her shoulder, heal her emotional wounds, etc. But don't let her make a permanent change. Make sure she chooses to remain the same in the end -- even if that means your novel feels like a personal tragedy for the detective.